Subsurface placement is the practice of getting nutrients placed into the soil versus leaving nutrients on the soil surface. Fertilizer sources commonly used today are highly soluble products that once exposed to water, can move off-site in the water flow. Exposing a fertilizer source to a greater volume of soil can provide more binding sites or reduce exposure to runoff. Options for surface application include fertilizer applications just prior to planned tillage; banded-placed nutrients either in the row as starter or as low-disturbance banded applicators; or strip tillage. Where no-till practices are used, nutrients can be managed with banded applications. Subsurface placement is considered an in-field practice. The placement of phosphorus and potassium fertilizer in relation to the soil surface can have consequences for crop production. 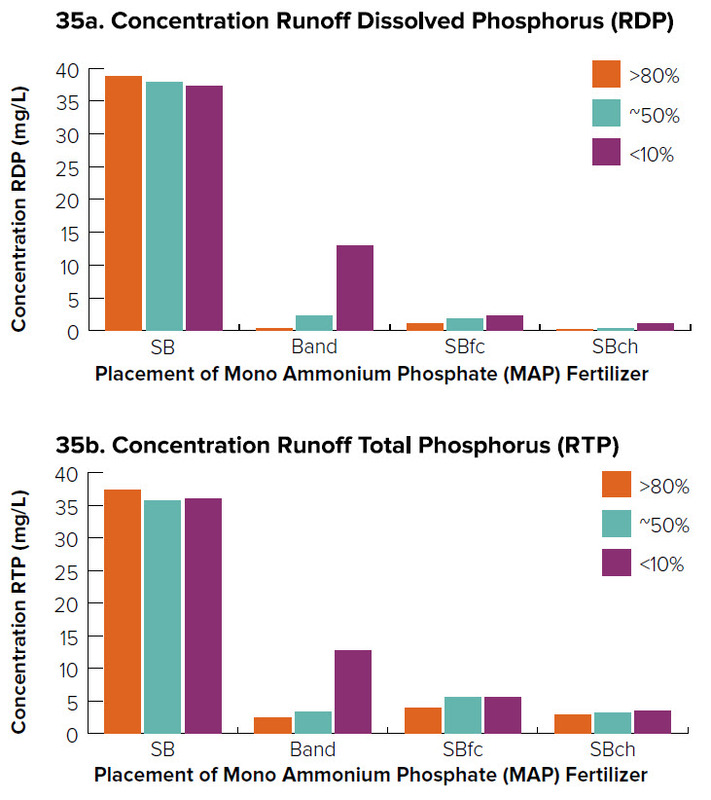 Water quality concerns regarding phosphorus loss also increase with surface application. Acute losses of phosphorus can occur when a runoff-producing rainfall event occurs shortly after surface applications. Chronic losses of phosphorus occur where high-soil test phosphorus soils are exposed to periodic runoff producing rainfall events. levels of 59 PPM at 0- to 2-inch depth and 35 PPM for the 2- to 8-inch depth (Baker et al., 2017). These localized, higher soil test levels resulting from stratification likely play a role in water quality impacts. Subsurface placement of nutrients can reduce the temporary elevation of soluble nutrients on the soil surface where the nutrients are exposed to runoff or preferential flow through soil profile that elevates phosphorus losses. Subsurface placement exposes the soluble nutrients to more soil surface area and stabilizes the nutrients in the soil profile. Other nutrient factors are influenced by soil profile depth. For example, soil pH is influenced by soil formation and subsoil materials. Western Ohio soils formed on a more basic (higher pH) limestone base while eastern Ohio soils typically have more acidic (lower pH) shale underlying the surface. The results of soil pH influence nutrient availability. From a general crop production standpoint, plant-root systems are able to obtain nutrients throughout the soil profile wherever soil moisture, oxygen, and nutrient availability support uptake. Plants generally have a greater percentage of their root systems located near the soil surface. In field studies that measured root system percentage at different soil profile depths, corn was found to have 50 percent of its root system in the 0- to 2-inch depth and 28 percent of its root system in the 2- to 4-inch depth (Fernandez, 2012). Under dry weather conditions, plant roots in shallow soil depth might dry out. This can result in temporary nutrient-deficiency symptoms. Under dry conditions, temporary potassium deficiencies might be observed. There have also been observations of potassium deficiencies where soil tests indicate adequate potassium. One useful piece of diagnostics might be an incremental soil test to determine the nutrient status at different soil depths. Banded fertilizer benefits low soil test conditions. At less-than-critical soil test levels, banded fertilizer applications reduce the fertilizer exposed to soil fixation. Fertilizer in the band maintains increased solubility due to reductions in fixation. For example, phosphorus availability was measured at 3.4 to 17.1 times the soil background level in the fertilizer band (Stecker, 2001). Banded fertilizer rates can be reduced by 25–50 percent. The goal in fertilizer addition is to maintain soluble soil nutrients for plant uptake. Banded applications have the characteristics described above (Stecker, 2001), including less fixation of nutrients, thus increased availability even 18 months after application. 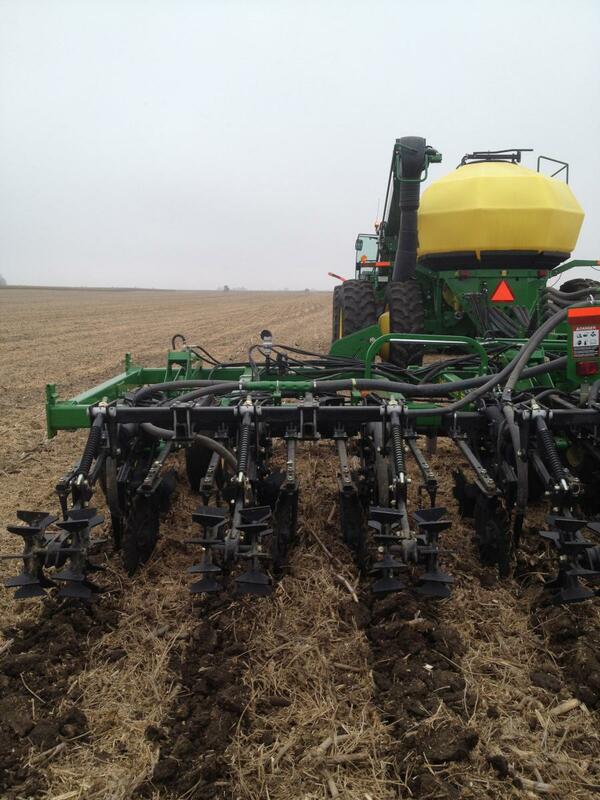 Deep banded placement is associated with strip tillage. These systems place nutrients 4–6 inches deep. Studies in Iowa and Illinois provide yield results for deeply placed phosphorus and potassium. Corn yields increased 5 bushels per acre in the Iowa studies (Mallarino, 2000). Corn increased 7 percent (Fernandez, 2012), and soybean yields increased 5 bushels per acre (Farmaha, 2011) in Illinois. The effect was attributed to potassium. The Illinois soybean study also noted a concern of salting injury under certain conditions. No yield effects were measured from added phosphorus. When starter fertilizers are used, limits to nitrogen and potassium total rates exist. Due to the potential of injury from fertilizer salt, these limits depend on how close the fertilizer is placed to the seed. For corn pop-up (placed in the row), the limit of N+K2O is based on the soil cation exchange capacity (CEC). Soils with a CEC of 7meq/100g or less should limit pop-up fertilizer to 5 lbs of N+K2O, and soils with a CEC of 8meq/1000g or greater should apply no more than 8 lbs N+K2O. In a 2 by 2 placement, do not exceed 100 lbs total N+K2O for corn or 70 lbs N+K2O for soybeans. Higher concentrations of phosphorus near the surface do have consequences for water quality. Higher concentrations of phosphorus measured in soil tests result in higher levels of soluble nutrients leaving a site. Water moving across the soil surface to surface drains or directly to ditches/ streams will have a higher concentration of phosphorus. 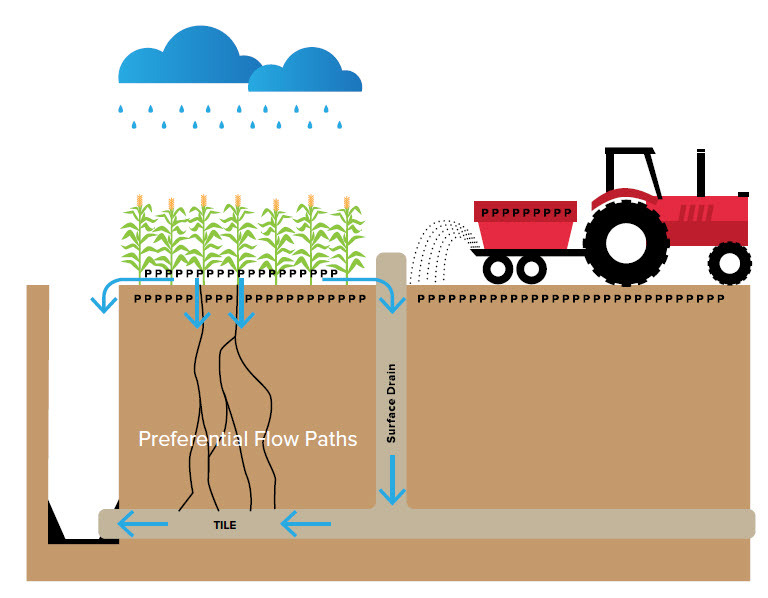 Preferential flow results in rapid movement of surface water through the soil profile to the tile system. Preferential flow from macropores is the result of “biological activity (eg., root channels, worm holes, etc. ), geological forces (eg., subsurface erosion, desiccation, and synaerisis cracks and fractures), or agrotechnical practices (e.g., plowing, bores, and wells). Surface cracks and channels that bypass the root zone are also responsible for rapid transport of moisture and chemicals through the unsaturated zone” (Cornell University). Surface application of phosphorus only increases the surface phosphorus concentration from stratification, if present, and can result in increased phosphorus losses through these loss paths. Figure 33. Higher surface levels of nutrients—combined with surface application of nutrients—can result in higher losses of nutrients via surface water movement, whether through direct runoff to a ditch, surface water features, or macropore movement. Edge-of-field monitoring studies in Ohio have resulted in a four times greater nutrient loss from surface-applied verses incorporated nutrients with a Mono Ammonium Phosphate (MAP) application of 175 lbs figure 34. The loss amounts to 1 percent of the applied phosphorus. A rainfall simulator study (Smith, 2016) indicated that loss as high as 17 percent of the application rate might be possible. Figure 34. 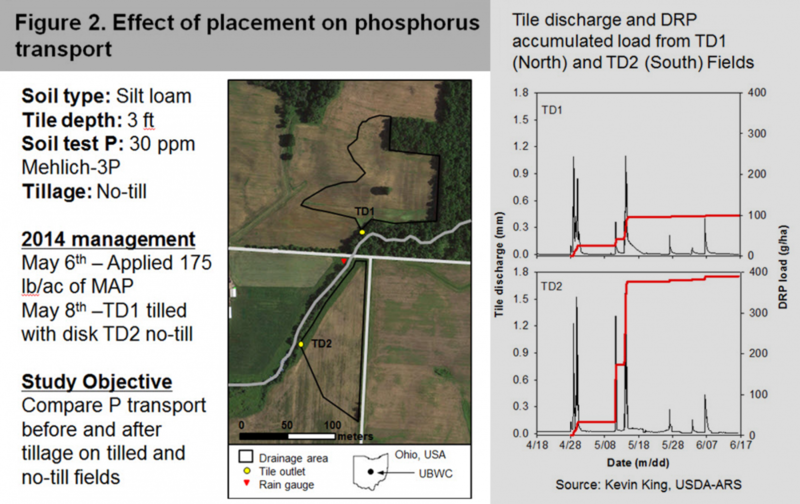 Effect of phosphorus placement on off-site transport following rainfall. Application was 175 pounds of MAP. Credit: Kevin King, USDA-ARS. highest concentration of runoff leaving the site. Tillage did result in higher runoff total phosphorus but did not approach surface banded loss that were primarily in the soluble form. Residue cover did not influence losses. Figures 35a and 35b. Results of a rainfall simulator study conducted in Ohio with RDP losses (35a) of 36 mg/l versus banded-chisel or field-cultivator-placed nutrients at less than 2 ppm. RTP losses (35b) increased with tillage indicate some increased erosion but did not approach RDP losses Credit for both images: Libby Dayton, The Ohio State University, 2018. Costs include the capital cost of new equipment and the logistics cost of fertilizer application. Newer banded equipment is designed to travel at higher speeds (up to 10 MPH), but swath width and other logistics might produce a higher per-acre cost of application. Banded-application rates might be reduced by up to 50 percent as compared to surface-application rates due to the reduced fixation that occurs in the band. The effects of reduced fixation have been measured up to 18 months after application. Long-term strategies of soil sampling might need to be adjusted if banded fertilizer is consistently placed in the same row space. Inter-row and between-row spaces might need to be sampled separately. If more random banded application occurs, this will be less of a concern. Regardless, the number of cores collected in soil sampling should be increased to 20–25 versus 10–15 if no banding has occurred. Equipment manufacturers and agronomists should be consulted for design information on this practice.